In technical subjects, learners respond well and benefit from the inclusion of imagery and video. How Do I Make a Good Screencast? In technical subjects, learners respond well and benefit from the inclusion of imagery and video. It seems obvious that our preferences in consuming information are changing rapidly today and rely less on textual comprehensiveness and more on brevity and reliance on conceptual images, both static and moving. 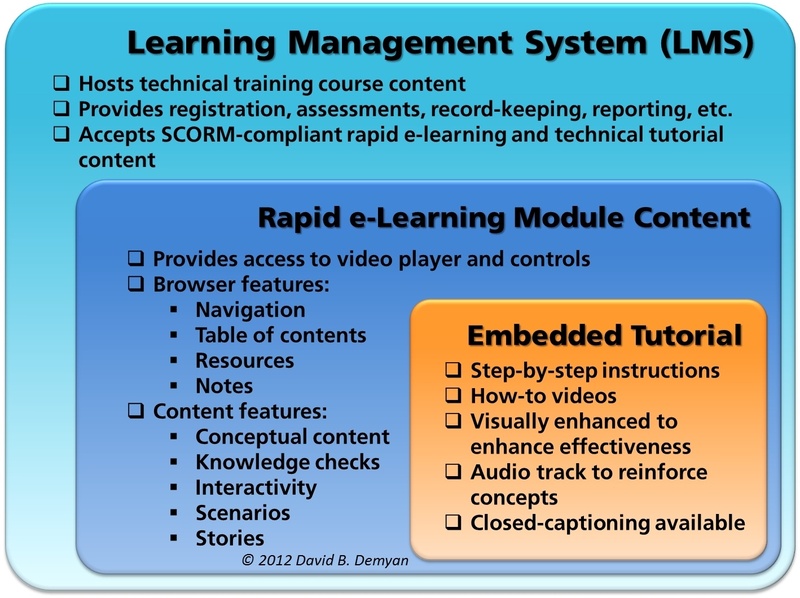 This may be a driving factor in the new face of e-learning in the 2010s or it may be an effect of learner preferences. Either way, it is imperative designers and developers of technical content at least be aware of these trends and be prepared to accommodate the way learners most effectively consume their material. My thesis is that technical training about computerized devices is greatly enhanced with the inclusion of screencasts to illustrate key concepts and tasks. Generally, more is better. This applies when adding a static graphic to content as well as brief descriptive text or audio. The same is true of moving content accompanied by either textual or aural commentary. None of this implies that knowledge checks and traditional Kirkpatrick evaluation levels should be ignored or eliminated. On the contrary, the need to assure our content is meaningful is greater than ever today. Some of what passes for knowledge content on the popular web video sites is worth exactly what you pay: nothing. My opinion is that instruction by adolescents who have lots of time to kill and very little understanding of how to pass on knowledge about their skills can actually be harmful to well-meaning learners who waste time and learn the wrong things. In designing such a course, the author plans, segregates and categorizes the material. Is your course to be delivered in an enterprise where records of attendance and performance are required? Do you need to host your material in an easy-to-access enterprise “university” environment? Does your learning strategy belong in a more all-encompassing talent management system? This may require the services of an LMS. Are you teaching about the overall use of the software or the benefits of using it? Are you providing a conceptual overview or even information about the general workflow? Then you could author this material in Lectora, Articulate, Adobe Presenter, or any slide-oriented development tool. Are you teaching the steps to accomplish a task or set of tasks? Are you instructing the user on which menus to choose, which buttons to push, or how to operate controls in the software? Then you could author this material in Camtasia Studio, Adobe Captivate or even some of the free screen recording tools. Be careful with the free tools, however. Authors should strive to make the screencast professional and engaging for their audience. Some of the free screen recording tools lack the ability to include important enhancements I talk about later. In developing learning materials for both conceptual and task-based technical courses, all of the popular learning methodologies apply as they always do. Your pedagogical approach and storyboard may look different for each type of content, but the results will be the same: a comprehensive approach to accessing the appropriate learning receptors in your audience. Some practitioners have been using the screen capture/caster tools since inception around the end of the millennium. While it was a challenge in the early versions to create a comprehensive learning environment, some ambitious authors were able to get close with the ability to create web-delivered content that supported Flash hotspots, quizzes, surveys, and SCORM output. Using a screencast tool alone, it always was and still is harder to create interactive elements and examinations that drive a learning environment such as one would encounter in an LMS. We could demonstrate the steps a user would use, we could do some Kirkpatrick level one assessments, and we could accomplish some pretty impressive results. But I don’t think anyone was ever truly certified in a particular discipline after attending only screencasts without other interventions. But combining screencasts into other interactive e-learning environments such as an LMS, rapid e-learning tool, or both, can achieve impressive results. This is especially true if the screencast is professional and high quality, with rich visuals and audio. How Do I Make a Good Screencast? It is not helpful to suggest developers consult a professional in the screencasting community. Rapid e-learning development means never having to say “Do it for me!” A screencasting community exists and is similar to the separate communities around the major e-learning development tools. There are adherents to each tool and the choice of authoring software is important in how one proceeds in developing their professional connections. Opt for versatility and learn as much as possible about the features you want based on your understanding of the needs of the audience you are targeting. Here are some general ideas for maintaining the highest levels of information transfer. We will focus and amplify some of these guidelines in future articles. Use screen recordings for the right reasons. Use screencasting to show procedures and to teach technical subjects. Use other tools to cover concepts and perform evaluations. Make a high quality recording at the right resolution. Set up your system so you are not recording an empty desktop or toolbars that are not useful to the viewer. Also, choose the right dimensions in either a 16:9 or 4:3 ratio and maintain those dimensions throughout recording, editing, and production. Do not record the whole screen unless absolutely necessary. If you are only showing the upper-left corner of a screen during the recording, first show the whole application window, but limit your movements as much as possible. Then use the “zoom in” feature in editing to show better detail. Move and speak slowly and deliberately. Many new screencasters attempt to rush through the recording and move the mouse cursor like a crack-addicted cockroach. Don’t do it! Allow your viewers time to digest what you are showing. And there’s no need to run the cursor around in circles to illustrate something on screen. You can easily highlight interesting areas later in editing. Use the screen capture software features to focus attention. The screencasting application you choose should have features in editing that focus the viewer’s attention on important points—callouts, arrows, balloons, highlighters, zoom and pan. Learn how to use these features but do not overdo it in practice. There are plenty of articles available on making your voice a powerful instrument in teaching via the screencast. We will also cover this topic in a future article. LinkedIn: Camtasia Users-Group, Screencasters, Scrasters, and Adobe Captivate. Good screencasting technique discussions. http://www.learncamtasia.com. Lon Naylor and Michelle Schoen do a good job teaching people how to use Camtasia Studio. http://www.articulate.com/ and http://www.screenr.com/. Screenr is a free tool you can use to learn the basics. The Articulate folks know how to get the best results.